So we hopped to our boat to have the Two Rivers and Four Lakes Cruise. Why it’s called that way, because we would pass those during the river cruise. 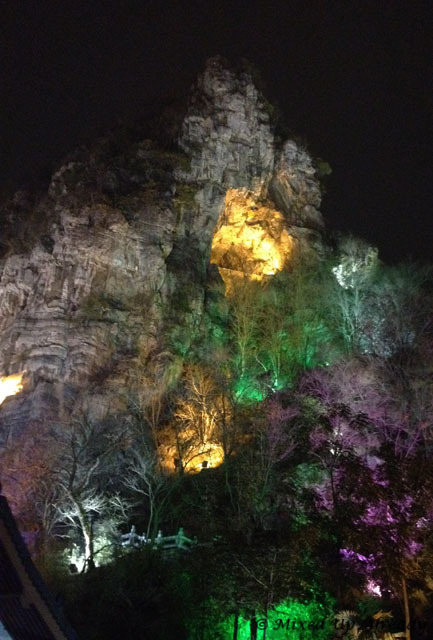 There are Li River, Taohua River, Ronghu Lake, Shahu Lake, and Mulong Lake. As I said, there were a few more boats that will do the river cruise with us. 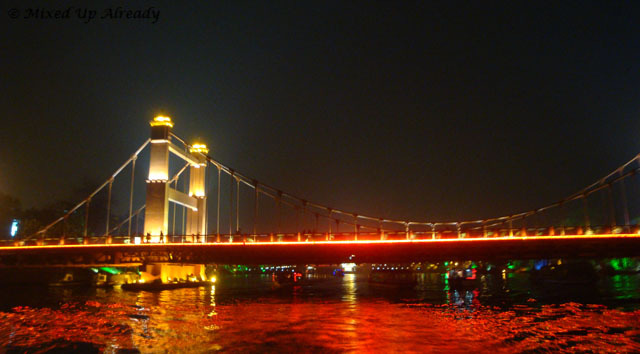 I wonder what can Two Rivers and Four Lakes Cruise offer to the tourists after a river night cruise in Guangzhou that offers the beautiful light that decorates the building and also Canton Tower or, two river cruises in Guilin: Yang Di river cruise, and Yulong River Cruise that offer beautiful scenery. 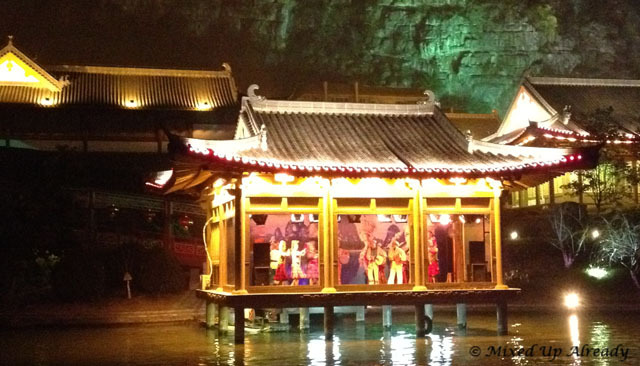 First to see is of course the Sun and Moon Pagoda on the Banyan Lake (Ronghu Lake or also called Shan Lake). 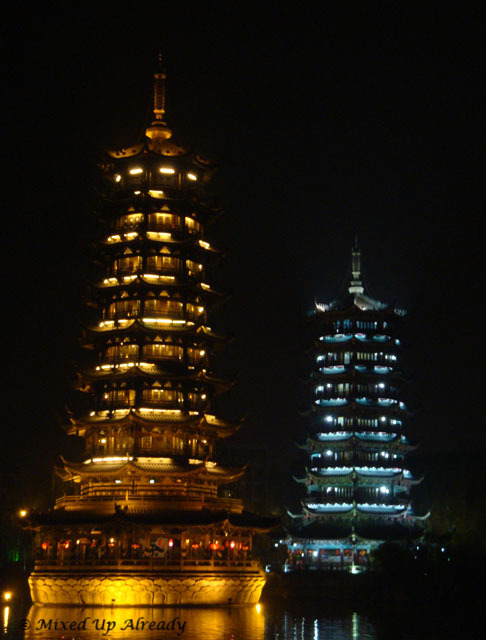 We could see these two copper pagoda from the pier as they’re tall enough … In fact, The Sun Pagoda, which is a nine storeys tower, is the highest copper tower in the world (the moon pagoda is a seven storeys tower). 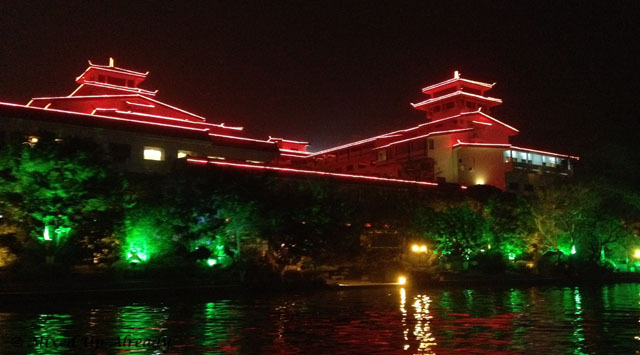 Then as the cruise went on, we could see more buildings with beautiful light, from the ICBC buildings, then Guilin Park Hotel, and then we could see the Ancient Song City at the Mulong Lake. Still in Mulong Lake, I could see another pagoda that stands high on the hill. It’s called Mulong Pagoda. The Pagoda is really bright, I think they installed the light at the entire pagoda. 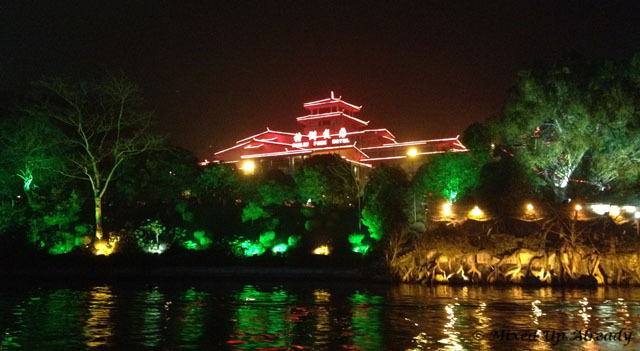 During the river cruise, we passed many bridges that have different and unique architecture, where some looks different with the bridge in Pearl River, and some looks the same. Also, another interesting thing was that we also passed some people that play music and dancing on the house-boat. A long-awaited trip … Hong Kong!